Copyright © 2014 Chiharu Miyata et al. This is an open access article distributed under the Creative Commons Attribution License, which permits unrestricted use, distribution, and reproduction in any medium, provided the original work is properly cited. In accordance of the Creative Commons Attribution License all Copyrights © 2014 are reserved for SCIRP and the owner of the intellectual property Chiharu Miyata et al. All Copyright © 2014 are guarded by law and by SCIRP as a guardian. Objective: The purpose of this qualitative study was to obtain a better understanding of nurse manager’s recognition behavior. Methods: This study, consisting of semi-structured interviews, was conducted in five hospitals with 100 beds or more in the Kanto, Kansai, and Kyushu regions of Japan. Fifteen nurse managers, who each had more than one year of professional work experience as a nurse manager, participated in this study. Results: We extracted four categories and fourteen subcategories as the factors related to the recognition behaviors in nurse managers. The first category is the basis of the recognition behaviors, which were divided into the following four subcategories: recognition behaviors that they received, perception of recognition behaviors, construction of confidential relationships with staff nurses, and the organizational climate. The second category is the issues that make recognition behaviors difficult, which were classified into the following three subcategories: multiple duties, number of staff nurses, and characteristics of the recent staff nurses. The third category is the factors regarding the staff nurses that must be considered, which consist of the following two subcategories: the characteristics and motivation of staff nurses and recognition behaviors that the staff nurses expect. The forth category is the methods of the recognition behaviors, which consist of the following five categories: watching over and consideration of individuals, evaluation of routine work, development as a professional, opinion sharing and delegating work, and promotion of work-life balance. Conclusions: The recognition behavior by nurse managers is influenced by their own experience, and nurse managers practice recognition behaviors in response to the charac- teristics of their staff nurses in a busy environment. Our results suggest that nurse managers need expertise in management for them to identity appropriate recognition behavior. Recognition behaviors impact individual, group, and organizational outcomes. For the individual, recognition has been associated with elevating one’s self-esteem [1, 2]. Positive self-esteem fuels psychological capital factors (self-efficacy, optimism, and resiliency), which can in turn affect job performance as well as how we communicate with patients, families, and peers and improve safety efforts [2,3]. Recognition in one’s workplace can lead to the perception of organizational support wherein people feel personally valued by their employers [4-6]. The relationship between recognition, retention, and engagement indicates that when people are recognized for their contributions and feel valued by their organization, they tend to feel satisfied and engaged, increasing the likelihood they will stay in their current position [7,8]. In contrast, the lack of recognition is associated with discontent, poor morale, and reduced productivity and has been cited as the primary reason for turnover of staff nurses . Inspired by the 1992 study by Blegen , Ozaki  translated the scale into Japanese in 2003 and modified it to correspond to nursing staff scenarios in Japan. As a result of factor analysis, it was discovered that there are five factors that correlate with job satisfaction: 1) reporting/announcing results; 2) supervising and supporting staff nurses; 3) assigning jobs with responsibility; 4) reporting evaluations from patients; and 5) respect of desired working hours. However, few studies have been conducted to identify the recognition behavior that is most important to nurses in Japan. Thus, we focused on the recognition behavior by nurse managers. In our previous study, we investigated how staff nurses perceived the nurse managers’ recognition behaviors and found that there was a discrepancy in the practical approaches to these behaviors between the nurse manager and staff nurses. We assumed that one factor causing this discrepancy could be perception gaps between the nurse manager and staff nurses. We also found discrepancy among the recognition behavior factors. Furthermore, we would like to clarify the structure of the nurse manager’s recognition behavior. Therefore, the aim of this study was to obtain a better understanding of the manager’s recognition behavior with semi-structured interviews. Fifteen nurse managers participated in this study. They were selected from five hospitals with 100 beds or more in the Kanto, Kansai, and Kyushu regions of Japan. Following the agreement of the involved organizations, the researchers explained the project and procedures to the nurse managers. Criterion sampling was used as intentional sampling because each person had at least one year of experience as a nurse manager. All participants were women. The mean age was 46.6 years (range: 42 - 50 years). Regarding professional work experience as a nurse manager, the mean experience was 5.1 years (range: 1 - 9 years) (Table 1). 1) How do you think about recognition behavior? 2) Is there anything that has affected your perception of recognition behavior? 3) What type of recognition behavior do you think the staff nurses expect? 4) What type of recognition behavior do you usually give to the staff nurses? 5) What kind of response do you receive from the staff nurses? 6) Do you feel it is difficult to engage in recognition behavior for staff nurses? All interviews were conducted in a private area at the nurse managers’ workplace for 0.5 to 1 h. Interviews were audio-recorded and later transcribed for the analysis. The rigor and trustworthiness of this study process and its findings were guided by Lincoln and Guba’s criteria for evaluating qualitative research [11,12]. They developed the following criteria to demonstrate the trustworthiness of qualitative studies: credibility, transferability, dependability, and conformability. Table 1. Demoraphic characteristics of the nurse managers. over one year of experience as a nurse manager . Second, the researcher exchanged e-mails with the participants before the interview to build a strong, confidential relationship. Third, membership checks were performed .  Transferability: Participants in the present study were all classified in the same way (as nurse managers) and each was required to meet strict inclusion criteria. In Japan, a clear definition of nurse manager has been lacking in the literature, making it difficult to analyze and synthesize the findings from previous studies. The nurse manager definition in this study allowed us to apply the research findings with confidence.  Dependability: The author who conducted all the interviews received feedback on interviewing techniques from an expert senior investigator in the research team. This approach facilitated consistency of the data collection methods.  Conformability: All interviews were audio-recorded, contributing to maintaining an audit trail that could be used to trace each step of the analysis back to the original study protocol. Content analysis of the data and peer review of the steps in the analysis were achieved through an interactive feedback process with the research team. The study was approved by the Ethics Committee of Kyoto University Graduate School and the Faculty of Medicine. Additionally, research permission was given by the chief nursing directors of all five hospitals. The authors independently reviewed the transcriptions and constructed tables of code categories based on the actual words or phrases (meaning units). We independently identified themes representing one or more code category and specific quotations representing each code category. This qualitative content analysis approach was adapted from Graneheim and Lundman . We used the Nvivo 9 software program (QSR International Pyt Ltd, Concaster, Victoria, Australia) to count the meaning unit code categories. We discussed the coding theme and the major themes arising from the data to reach consensus. We extracted four categories and fourteen subcategories as the significant factors of the nurse manager’s recognition behavior (Table 2). We selected four subcategories as the basis of recognition behaviors, which were recognition behaviors that they received, perception of the recognition behaviors, construction of a confidential relationship with staff nurses, and the organizational climate. 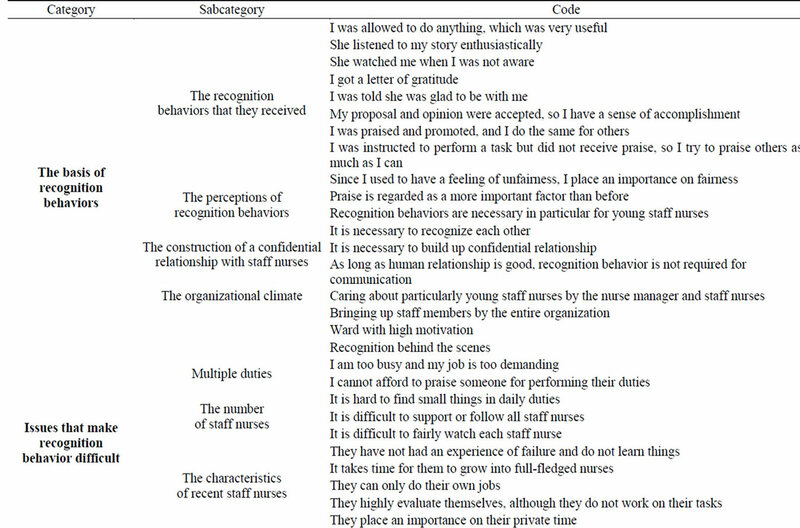 The recognition behavior that they received included nine codes, which were “I was allowed to do anything, which was very useful”, “She listened to my story enthusiastically”, “She watched me when I was not aware”, “I received a letter of gratitude”, “I was told she was glad to be with me”, “My proposal and opinion were accepted, so I have a sense of accomplishment”, “I was praised and promoted, and I do the same for others”, “I was instructed to perform a task but did not receive praise, so I try to praise others as much as I can”, and “Since I used to have a feeling of unfairness, I place an importance on fairness”. Fourteen participants (93%) answered that these recognition behaviors that they received are the basis for their current perceptions of recognition behavior and practice. The perceptions of recognition behaviors included two codes, which were “Praise is regarded as a more important factor than before” and “Recognition behaviors are necessary in particular for young staff nurses”. Eleven participants (73%) recognized that recognition behaviors are necessary for the growth of staff nurses. The construction of a confidential relationship with staff nurses included three codes, which were “It is necessary to recognize each other”, “It is necessary to build a confidential relationship”, and “As long as the human relationship is good, the recognition behavior is not required for the communication”. They told us that the confidential relationship with staff nurses is a premise for the practice of recognition behaviors. The organizational climate included four codes, which were “Caring about particularly young staff nurses by the nurse manager and all staff members”, “Bringing up staff members by the entire organization”, “Ward with high motivation”, and “Recognition behind the scenes”. They placed importance on having a culture of personal development at the workplace wherein the nurse manager attempts to be uplifting for staff nurses in the entire ward or hospital. Table 2. Recognition behavior: Category, Sabcategory and Code. which were “They have not had an experience of failure and do not learn things”, “It takes time for them to grow into full-fledged nurses”, “They can only do their own jobs”, “They highly evaluate themselves, although they do not work on their tasks”, and “They place an importance on their private time”. The nurse managers found human resource development difficult due to the characteristics of young staff nurses. The factors that must be considered regarding staff nurses consisted of two subcategories, which were the characteristics and motivation of staff nurses and recognition behaviors that the staff nurses expect. The characteristics and motivation of staff nurses had six codes, which were “It is necessary to change the recognition behaviors according to the levels of motivation,” “We practice recognition and instruction by sorting the staff nurses into three categories,” “We understand their background and character”, “We understand staff nurses and recognize their personalities”, “Recognition depends on their age”, and “Timing to speak”. Nine participants (60%) with more than five years of experience as a nurse manager stated that the level of recognition needs to be changed depending on the individual characteristics and the age of the staff nurses. The recognition behaviors the staff nurses expect included four codes, which are “They want to be praised by patients and their families”, “They do not expect excessive recognition”, “They place an importance on detailed evaluation”, and “They want to be recognized by co-workers and seniors”. The participants judged what type of recognition behaviors the staff nurses expect based on the response or remark of the staff nurses. The methods of recognition behaviors had five subcategories, which were watching over and considering individuals, evaluating routine work, developing as a professional, opinion sharing and delegating work, and promoting work-life balance. The watching over and considering individuals consisted of six codes of empathic recognition behaviors for each staff nurse, which were “We listen to staff nurses talking”, “We offer a warm expression”, “We provide a feeling of security that they are watching the staff nurses”, “We speak to the staff nurses with interest”, “We accept their existence”, and “We look at them doing their best”. The evaluation of routine work had four codes, which were “We look at and evaluate the inventive ideas of the staff nurses”, “We share care for patients and evaluations from patients”, “We praise the staff nurses for doing their best with concrete words”, and “We praise staff nurses particularly when they are busy”. The development in a professional job contained three codes, which were “We praise the good points of the staff nurses at personal interviews, which are regularly carried out, and reinforce that they are doing a good job/recommend additional training and education to increase their motivation”, “We recommend the next step”, and “We mentor the staff nurses so that they can be independent”. The opinion sharing and delegating work included three codes, which are “We transfer authority and support them”, “We listen to their opinions and incorporate feedback”, and “Delegating work increases their motivation”. The promoting work-life balance included two codes, which are “Requests are respected for work schedule although equality is regarded as important” and “Request for days off and privacy is respected”. Most participants reported that there is a balance between work and privacy. The factors that lead to the practice of recognition behaviors were structured for how the categories are placed (Figure 1). We should discuss the meaning of the four categories. The recognition they received before they became nursing managers affects how the nursing managers behave when they take on that role. “Role model” and “Initial work experience” can promote the growth of a middle leader . The nurse managers in our study learned from the nurse managers before them, and they modeled their concept of a nurse manager on their predecessors, which included recognizing the importance of recognition behaviors. Furthermore, the nurse managers believed that the need to build a confidential relationship with the staff nurses and the organizational climate in which persons are accepted are essential for the staff nurses to favorably receive recognition behaviors. The relationship with their superiors can stress staff nurses even when the support from their superiors is relatively high, which indicates that the support from superiors has both positive and negative influences . In other words, the organizational climate and construction of the relationship with staff members are important factors that affect the improvement of the staff members' motivation. Recognition behaviors by a nurse manager are based on the experience of the recognition that they previously received, perception of recognition behaviors, the confidential relationship with staff members, and the organizational climate in which persons are accepted and allowed to grow. Figure 1. Construction of recognition behavior. nurses Nine nurse managers who have more than five years of experience as a nurse manager (60%) chose a method of recognition behavior based on the characteristics and age of the staff nurses. Nomi et al. reported that the support from a superior strongly influences the empathic organizational commitment of staff nurses with over five years of experience compared to those with fewer years of experience. The participants talked about the difficulty in recognition for nurses with many years of experience, who can manage all tasks. They judge the difference in years of experience based on their experience as a nurse manager. In particular, one nurse manager who earned a master’s degree in management practiced recognition behaviors by classifying the staff nurses according to their types and referring to such evidence. Atwater et al. suggested that the method of feedback needs to change in accordance with the difference in the characteristics and motivation of staff members. Thus, it is thought that the expert knowledge of management is an important factor influencing the practice of recognition behaviors. As for recognition behaviors that staff nurses seem to expect, Greg  indicated that the relationship with patients and positive feedback from patients and their family members brings a feeling of fulfillment and joy to the nurses. A nurse can begin to offer appropriate nursing care with experience and boost self-confidence in his or her ability to practice. Staff members grasp their own growth and recognition through the existence of their co-workers and recognition of each other as individual people improves their abilities. Additionally, competing and treating each person positively will improve job satisfaction, and the nurses look at their co-workers as people they can cooperate with in a friendly way. Therefore, being praised and recognized by patients and their family members, co-workers and seniors, which has been regarded as a recognition behavior expected by staff nurses, is an important recognition behavior. The nurse managers believe their staff nurses do not expect excessive recognition. There is a culture in which individuals are not accepted positively in Japanese organizations and society, and even though Japanese people strongly wish to be recognized, they are unlikely to share that wish with other people . Nurse managers are aware of the cultural background of our country. 2) Issues that make the recognition behavior difficult Most of the nurse managers talked about the difficulty in having multiple duties and the number of staff nurses. Nurse managers are also stressed with some of the business aspects of medicine such as practicing high quality medical treatment while there is a shortening of hospitalization days and medical cost reduction. Furthermore, nurses are expected to improve quality and quantitywhich are contradictory duties. Moreover, in spite of the recommendation that the number of persons one administrator manages should be around fifteen (span of control), the number of nurses for one ward is over twenty or thirty. In addition, younger nurses tend to lack aggressiveness and identity, are afraid of making mistakes, wait for directions, and are passive, as indicated by the fact that they do only what they are told to do . Overseeing younger nurses makes the recognition behavior practice of the nurse manager difficult. 3) The methods of recognition behavior In the studies by Blegen et al. and Ozaki , evaluation of staff members by language and feedback behaviors were commonly observed in the recognition behaviors that nurse managers concretely practiced. However, the results were not conveyed or presented to others as a recognition behavior. Herzberg  reported that there are common points in the incidents in which staff members feel job satisfaction and many of them include achievement, recognition, the job itself, responsibility, and promotion. Thus, recognition in a workplace is one of the processes that strengthens the awareness role of staff nurses, increasing their job satisfaction as well as their commitment to the organization. The feeling of job satisfaction is important for job motivation. Job satisfaction is actually felt when the people realize their abilities and potential through the job and experience mental growth. There are problems related to the labor circumstances and conditions of nurses such as heavy work burden, long working hours, and the use of paid holidays for night shifts. It is hard to expect staff nurses to love their jobs and feel joy when they are working in an environment where there is insufficient time to provide adequate care. Once staff nurses feel that their hospital offers an environment that promotes ideal nursing, they have a sense of belonging to the hospital and experience higher job satisfaction. As nurse managers realize, recognition as a positive evaluation for patient care is particularly necessary when the nurses are busy. Ota  categorized recognition based on the temporal axes and content, instead of on subjects who are given recognition. One is everyday recognition, which relies on desire for recognition, recognizes routine and leads to the improvement of short-term motivations, and the other is recognition of career, in which a management-level employee performs with a medium-and-long term viewpoint. From the viewpoint of career recognition, as years of continuous employment become long, nurses reach a transitional period such as marriage and raising children, and at the same time, the organization expands the role for the workers. In such a period, it is necessary to establish a flexible career design to meet the changes such as role assignments that satisfy individual needs and provide opportunities for study. Promotion is also included in career recognition. The recommendation for a staff nurse to aim to become a manager indicates that the staff nurse has received a positive career evaluation, which influences job satisfaction. However, although the number of nurses is larger than other health professionals in a hospital, few of them are promoted to the managerial class. For the nurses who do undertake a post, it is necessary to recognize their career by recommending that they join workshops that promote expertise in their specialty even if they are not going to be promoted. Lim et al. has reported that maturity as an adult leads to employment continuation. The sense of values among the people shows diversity; therefore, we expect career development in which each individual can prioritize their work or privacy depending on their situation. Thus, the promotion of work-life balance is a challenge for nurse managers. In this study, we aimed to reveal the factors related to recognition behaviors by nurse managers through interviews. We found that the recognition given by a nurse manager is influenced by their own experiences, and the nurse managers conduct recognition behaviors while they consider the characteristics of their staff members in a busy environment. These results can be utilized for future nurse management and for the required practice of knowledge and recognition behaviors. In this study, there are some limitations: first, the results present only the nurse managers’ perspective of the recognition behavior and may miss the perspective of staff nurses. Second, there are many interlinking factors, such as the individual’s sense of values, regional characteristics, and job locations, and these have not been discussed. We are extremely grateful to Dr. Fusako Ozaki for sharing her knowledge of nurse manager’s recognition behavior. In addition, we would like to thank all of the nurse managers who took time out of their busy professional and personal lives to assist us by participating in the interviews. The participants were invaluable to us as they were open and honest in discussing their daily work lives as well as their perceptions of the nurse manager’s recognition behaviors that influence their staff. Their willingness to share and discuss this information is greatly appreciated. Part of this work was supported by Grants-in-Aid for Comprehensive Research on Aging and Health from the Ministry of Health, Labor, and Welfare of Japan (H24-Tyojyu-001). Guba, E.G. (1981) Criteria for assessing the trustworthyness of naturalistic inquiries. Education Communication Technology Journal, 29, 75-91. Lincoln, Y.S. and Guba, E.G. (1985) Naturalistic inquiry. Sage Publications, Calif.
Kanai, Y. and Furuno, Y. (2001) Quantum leap experiences for leadership development-developing middles managers as basis of intellectual competitiveness hitotsubashi. Business Review, 49, 48-67. Tanaka, M. (2007) Reconsideration of contemporary nursing issues based on the theory of profession. Bulletin of the Graduate School of Yamagichi Prefecutural University, 8, 119-128. Nohmi, K., Mizuno, M. and Ozawa, M. (2010) How factors relating to affective commitment to organization vary depending on the years of nursing experience. Japan Academy of Nursing Science, 30, 51-60. Gregg, F.M. (2005) Clinical nurses’ experiences which facilitate organizational commitment. Gifu College of nursing Journal, 6, 11-18. Ohta, H. (2011) Shounin to motivation (Recognition and Motivation). Dobunkann, Tokyo. Takahashi, H., Ida, M. and Nishimatu, Y. (2011) Development of full-fledged employee scale and verification of its reliablity and validity. The Journal of Psychology Rissho University, 2, 81-96. Herzberg, F., Mausner, B. and Snyderman, B. (1959) The Motivation to Work. 2nd Edition, John Wiley & Sons Inc., New York, 20, 141-147.